May 29, 2011 - The first Airbus Military A330 MRTT new generation tanker/transport for the Royal Australian Air Force (RAAF) left Madrid on its ferry flight to Australia. Designated the KC-30A in RAAF service, the aircraft is scheduled to arrive at RAAF Base Amberley, Queensland on Monday 30 May, and to be formally handed over to the RAAF in the next few days. On its ferry flight, the A330 MRTT is being flown by Airbus Military and RAAF crews, and will transit via McCarran (Nevada) and Hickam (Hawaii) in the USA. The aircraft is the second converted by Qantas Defense Services in Brisbane, which was returned to Madrid for painting and finishing. It will be joined by the second aircraft for the RAAF in June, and two further aircraft later in the year. The fifth and final aircraft ordered by the RAAF, which arrived in Brisbane for conversion a few days ago, will be delivered next year. The arrival of the aircraft at RAAF Amberley follows an extensive development and test program for what is the world?s only certified and flying new generation tanker/transport aircraft. Civil Supplemental Type Certificate was obtained in March 2010, and the military certification in October. In RAAF service the A330 MRTT will be equipped with two underwing refueling pods, the fly-by-wire Airbus Military Aerial Refueling Boom System (ARBS), and a Universal Aerial Refueling Receptacle Slipway Installation (UARRSI) enabling it to be refueled from another tanker. It is powered by two General Electric CF6-80E engines. It is equipped with a comprehensive defensive aids suite (DAS) and fitted with 270 passenger seats. 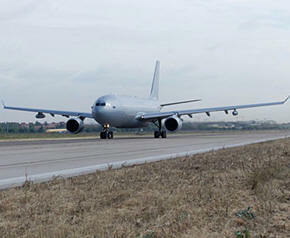 Having received its supplemental type certificate from European civil certification Authority EASA in March 2010 and military certification from Spanish Authority INTA in October, the Airbus Military A330 MRTT is the only new generation strategic tanker/transport aircraft flying and available today. The large 111 tons/ 245,000 LB basic fuel capacity of the successful A330-200 airliner, from which it is derived, enables the A330 MRTT to excel in Air-to-Air Refueling missions without the need for any additional fuel tank. The A330 MRTT is offered with a choice of proven air-to-air refueling systems including an advanced Airbus Military Aerial Refueling Boom System, and/or a pair of under-wing hose and drogue pods, and/or a Fuselage Refueling Unit. Due to its wide-body fuselage, the A330 MRTT can also be used as a pure transport aircraft able to carry 300 troops, or a payload of up to 45 tons/99,000 lb. It can also easily be converted to accommodate up to 130 stretchers for Medical Evacuation (MEDEVAC). To date, a total of 28 A330 MRTTs have been ordered by four customers (Australia, Saudi Arabia, the United Arab Emirates, and the United Kingdom), with Saudi Arabia having already placed a repeat order.